This work attempts to imagine a wood/world prior to, and free from, human intervention. By physically removing the original image’s “subject”—the hunters—I attempt to unearth a forest subsumed by the narratives of colonialism. In reading a traditional image or text through this lens, I try to animate or bring into focus that which has been rendered scenic, passive or ornamental. By refusing to exist merely as a backdrop against which the human performs his exploits, “Pre-Colonial Forest” asserts a certain subjectivity of its own. 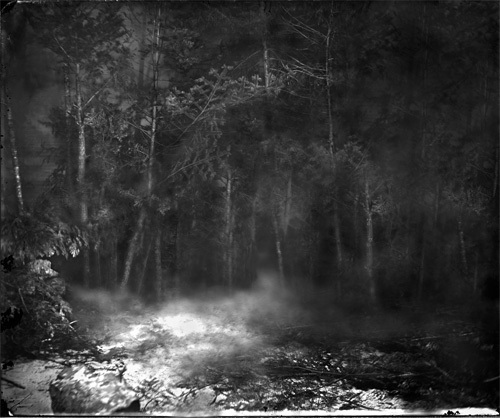 The irony is that the forest in the original image is itself a fabrication, completely constructed by William Notman and his assistants in studio. Rather than undercutting the presumed authenticity of the image, this seeming contradiction points to the recurrent mythology of wilderness itself in the colonial imaginary. Image 1: “Pre-Colonial Forest in Fog” (a biocentric reading of William Notman’s “Around the Campfire, Caribou Hunting Series”). Yedda Morrison, 2009.